Kate and I had such a wonderful time! Thank you for all of your work, recommendations, and attention to every detail. It truly was a trip of a lifetime. Your "office" of the Tuscan hills is the best "office" we've seen. Here's the picture of us buying our dishes. We will think of you and Italy every time we use them. I want to personally thank you for such a wonderful time I had riding in the hills of Tuscany with you. It was definitely a memorable bike ride, the breathtaking scenery, the fresh air, the delicious wine tasting, but most of all the great company! These are cherished memories I have of my adventure in Italy and how I long for the day when I will be back riding Under the Tuscan Sun... Molto Grazie!!! Ciao! Mary (Maria) and Bijan Pashanamaei, Pennsylvania, U.S.A. So sorry it has taken us a while to write to you. We just received the photo of Mario – thanks so much! We wanted you to know that our time spent with you was the best part of our trip to Tuscany and we told Diane this. We raved about you and how well you took care of us. We told Diane that she should hang on to you as a business partner because you were such a gem. 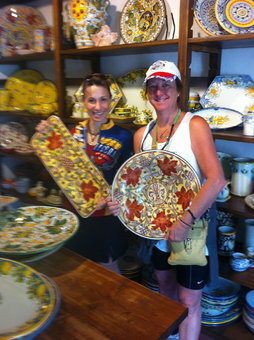 Thanks again so very much for the wonderful cycling through Tuscany. You provided us with the best views, the best food and the best accommodations of our entire trip. We are grateful for your tremendous knowledge of cyclists and cycling and how you used this to create a magical tour for us. We told Diane that the only regret we had was that we didn’t spend more time cycling with you! Next time, you will also be on a bicycle with us! We hope to return to Tuscany with a bunch of friends to cycle with you again. Maybe the Dolomites next time! Please know that if you are ever on the East coast of the US, you have a place to stay and cycle. We would love to show you Chester County, Pennsylvania from a bicycle. All the best to you, your team and your business. Thanks again, so very much! Mary Outten, Santa Fe, New Mexico, U.S.A. I have to tell you that I have been on several wonderful bike trips in Italy. Other companies cannot hold a candle to the level of personal, professional service you provide to your clients. I have never experienced such a high level of attention to detail and the pure luxury of such an amazing guide as yourself. I Bike Tuscany is THE BEST.